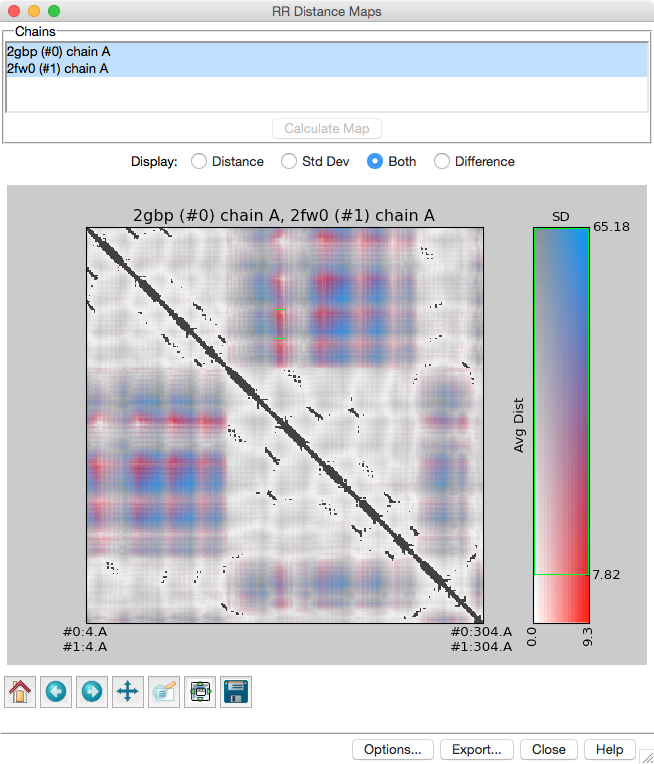 RRDistMaps: a UCSF Chimera tool for viewing and comparing protein distance maps. Chen JE, Huang CC, Ferrin TE. Bioinformatics. 2015 May 1;31(9):1484-6. There are several ways to start RR Distance Maps, a tool in the Structure Comparison category. Individual chains or blocks of chains can be chosen from the Chains list with the left mouse button. Ctrl-click toggles the status of an individual chain. 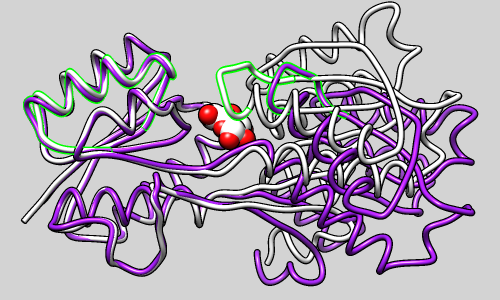 Only protein chains containing α-carbons will be handled. If a single chain is chosen, an individual distance map will be generated. If multiple chains are chosen, they must have sequences similar enough to be aligned. The sequences will be aligned to obtain residue equivalences, and distance differences (if two chains), means, and standard deviations will be calculated for equivalenced residue pairs. Clicking Calculate Map aligns the sequences (if multiple chains) and creates the map. The sequence alignment is shown in a Multalign Viewer window. The colors can be changed in the options, and values outside of the range of interest can be masked by adjusting the green outline within the color key. Clicking Export brings up a dialog for saving the matrix data (distances, and if multiple chains, standard deviations, and if two chains, differences) to a text file as tab-separated or comma-separated values. Close exits from RR Distance Maps, and Help opens this manual page in a browser window. Placing the cursor over the map reports the corresponding value(s) and structure residue IDs in the status area near the bottom of the window. Dragging to select a rectangle within the map selects the corresponding structure residues in the main Chimera window. The green outline within the color key to the right of the map defines the range of colormapped values. The color key always contains the full range of values, but the edges of the green rectangle can be dragged smaller and the whole rectangle can be dragged to reposition it within the key. Values outside the range of the green rectangle are masked to a single color in the map (the excluded color, default almost-black). The green rectangle cannot be resized continuously, but the color key can be subdivided more finely using the options. If the map window becomes obscured by other windows, it can be resurrected with the Raise option for the RR Distance Maps instance in the Tools menu. Several standard navigation icons below the plot are provided by matplotlib. If a mouse mode such as zooming is activated by clicking one of these icons, it is necessary to click the icon again to turn the mode off. Clicking Apply updates the map display; it also removes any masking, but subsequently the green rectangle can be resized smaller again to resume masking. Reset restores the default settings in the dialog, and Cancel simply dismisses the dialog. Note: a simple binary contact-map-like appearance can be obtained by masking low (contact) distances after setting the excluded color to black and all other colors to white, or using some other similar dark-light scheme. Sequence alignments. Pairwise alignments are calculated with the Needleman-Wunsch algorithm. Multiple alignments are calculated with a MUSCLE web service, with settings as described for Align Chain Sequences. Combined (multiple-chain) maps only include residues from fully populated alignment columns. Only sequence alignment columns containing residues from all chosen chains are used to define the residue equivalences in a combined map. Coloring is applied across the full value range. Although high and/or low values can be masked, colors can only be specified for the minimum and maximum values in the entire map. It might be useful to specify colors for the minimum and maximum values of a narrower range of interest to emphasize variations within that range. Combined (multiple-chain) maps omit terminal residues. Related to the preceding point, the N-terminal two positions and C-terminal two positions are omitted from a combined map, because it was found that large standard deviations arising from these positions made it difficult to see variations on a smaller, more generally useful scale.